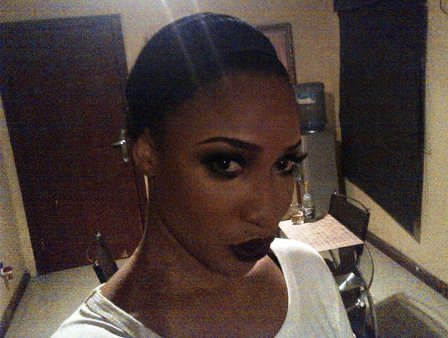 Tonto Dikeh is one actress who knows she is controversial and does nothing to counter that notion. 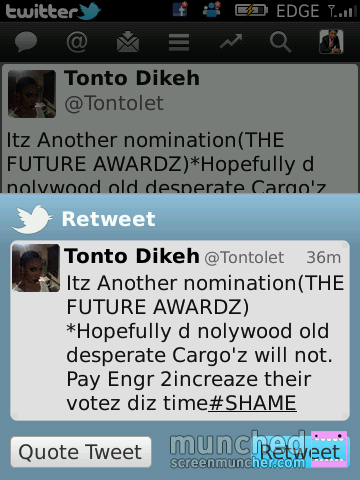 As the future awards nominees have been released, Tonto Dikeh who is nominated in the "Actor of the year" category has thrown a jab at a fellow nominee who she calls” Nollywood Old Cargo”. On her twitter handle this morning, she made references to the actress manipulating votes in the past which brings our mind to none other than award winning actress,Ini Edo. In Nov 2011,Rita Dominic and Stella Dimoko of Encomium mag, accused Ini Edo of manipulating her online votes for the Arik Airline award category for best actress during the African International Film Festival. Stella Dimoko replied this way: “If d oda contenders were cheatn, dey must hve don it with sense. Hw d hell am I suppose to kip quiet wen @ ini 4phil takes d cheating overboard? These outcry resulted in the cancellation of the process. HEH LOOK KEETLE CALLING POT BLACK. PLS TONTOH REMIND ME WHO IS OLDER U OR RITA. TO ME SHA EVEN IF RITA IS WHICH I DOUBT SHE STILL LOOKS YOUNGER THAN U. FORGET ABOUT MAKE UP`S, COME OUT ON HAMMARTAN SEASON IN THE MORINIG U WILL SEE WHAT AM SAYING. SECONDLY RITA COMMANDS MORE RESPECT THAN TONTOH DIKE PERIOD. SO GO AND HIDE FOR MAROKO. Mr. Poster,the headline of this story says ( Tonto Dikeh Calls Rita Dominic "Old Desperate Cargo") and the story is telling us that she is referring to Ini Edo. Life is damn too short to be sitting around miserable. BUT WHY UNA ALLOW AM DO AM? who ever post this must be sick in the head.......... how could topic be about RITA AND TONTO and You have To Bring INI EDO into it?